Kirsten is a longtime LibraryThing member (member GlitterFemme), and an avid reader and book collector. She was born in Massachusetts and lived in Virginia and Puerto Rico before landing in Maine, where she has spent most of her adult life. She lived in San Francisco from 2007–2010 and did her best to clean out the Bay Area’s many independent booksellers, requiring an upgrade from a 10′ box truck to 16′ when she moved from California to Maine. Kirsten lives with her 16-year-old brother who is a computer and video game aficionado, and their two very spoiled cats. She studies belly dance and ballet, rides a metallic purple beach cruiser, and enjoys trying to make complicated dishes in her tiny, ill-equipped kitchen. 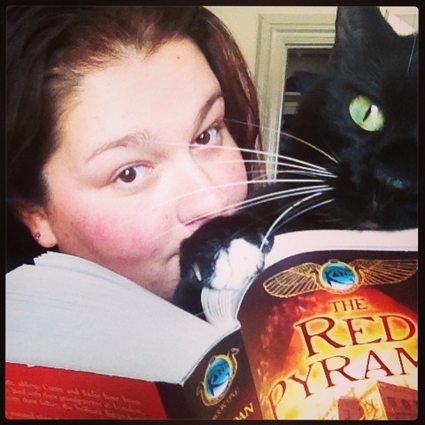 Her favorite authors include Roald Dahl, Brandon Mull, Mercedes Lackey, and Sarah Waters. You can follow Kirsten on Twitter at @Glitter_Fem. *For the longest time we were a completely virtual company. We now have enough employees in town to justify the occasional pizza or—today—donuts from The Holy Donut. Progress!